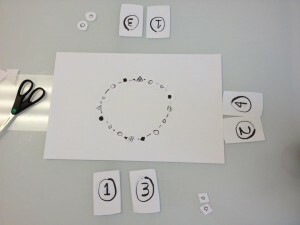 Eat Thyself is an abstract strategy board game created for the 2012 Global Game Jam. The rules and art necessary to print the game are available on the Eat Thyself page on the Global Game Jam site. The theme of the game design challenge was ouroboros, and the first diversifier (optional challenges) was to create a 1-dimensional game, so I immediately started thinking about board game designs playable on a circle. The ah-ha moment was deciding that there would not be a set number of “spaces” on the gameboard, but rather the game pieces would also make up the gameboard, and as pieces were captured, the board would shrink until only one player was left, and the game was over. The game was “complete” in about two hours. There was at least an hour (maybe two) of playtesting, and I wasn’t initially very happy with the amount of strategy possible with the game. After trying many variations, I think I hit on a game that does have some strategy in the end-game (and earlier, if you’ve played and know what you’re doing). It’s still definitely on the light side of abstract strategy, but overall, I’m fairly happy with how it turned out. Eat Thyself’s entry on Board Game Geek.